A secret message hidden beneath coconut-and-cashew truffles is revealed as the chocolates are devoured. The packaging seems fancy, but this is just a standard box trimmed with scalloping scissors; the tabs are usually tucked in, but we left them out, punched holes, and threaded ribbon through for a unique form. 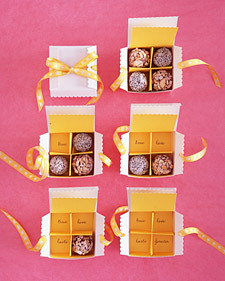 Choose a small, square lidded box, just big enough to hold four chocolates. 1. Fold the box into shape. Use scalloping shears to cut decorative edges on the side and front flaps of the box. Punch a hole in the center of each side flap. 2. Cut colored paper for the liner; it should be as wide as the box’s interior and long enough to cover the bottom, one side, and the lid. Use a bone folder to score the paper where it will bend; then fold, and crease with the bone folder. Write one word in each of the four corners of the bottom. 3. For the dividers, cut two more pieces of colored paper to be as wide as the box and twice as high. 4. Score the dividers lengthwise down the center, and fold. Use a utility knife to cut a slit in the center of each divider so they’ll interlock; one should go from the bottom up to the middle, and the other should go from the top down to the middle. Slide the dividers together at the slits. 5. Place paper liner and the interlocked dividers in the box. 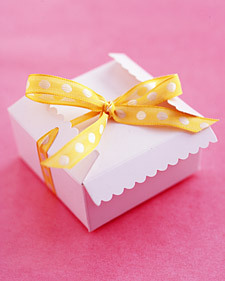 Wrap the ribbon around the box, and slip the ends through the holes in the flaps. 6. Fill the box with chocolates. Fold the paper liner down and then the lid down to close. Fold the side flaps in over the top. Tie the ribbon snugly over the box.